So, he’s not tech savvy. But he is the king of retro, the sultan of skating, the heart and soul behind an ingenious event: Down and Derby, a roller-skating dance party held once a month at Dekalb Market in Brooklyn. One thing you can always count on at Down and Derby is the old-school skates. Because most people don’t own quad skates, Mr. Masi brings a few hundred pairs, from his own collection, to rent out at each event. But amassing these skates was no easy feat. For the last four years he’s been scouring the Internet, utilizing Craigslist and eBay, and calling skate rinks that are going out of business in the hopes of acquiring more skates. “It’s a constant search,” he said, one that continues to this day. 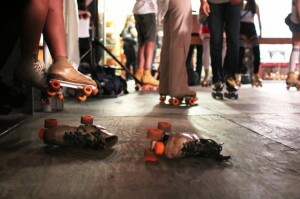 In fact, the difficulty of finding skates is one of the main reasons why he believes no one else has bought into the roller skating party trend. “It’s just so hard to find them,” he said. Last Friday, Mr. Masi held the second Down and Derby skating party at the Dekalb Market in downtown Brooklyn. As expected, all sorts of characters attended the event. There was a tan old guy in the white bell-bottoms; a hipster in a one-piece jumpsuit, striped socks, and red headband; a gaggle of girls in American Apparel short shorts, neon tanks, and, of course, headbands; a woman in Yoko Ono sunglasses; a guy in swim trunks; a couple who tried to dance-skate; a baby boomer who tried to roller-skate-break-dance; a couple of first-daters who stood on the sidelines and watched; newbies who fell on their butts; stiffer newbies who skated like robots; a dude in the sneakers that had wheels; and experienced roller derby players who showed off their skills. The wood plank floors at Dekalb Market made it easy for skaters to get around and the assortment of food venues and picnic tables provided refuge for those who needed a break. As the sky darkened, strings of light lit up the main skating area and infectious disco tunes cooed from the speakers. People fell, but no one laughed at them. They were in party mode, partaking in a dance nirvana, and well aware of the fact that they, too, might fall. So far it seems to be working. Until September, Mr. Masi will continue hosting monthly Down and Derby events at Dekalb Market, and will start searching for a new venue in the fall.